Tension gripped Model Town area in North-West district today after the parents, relatives and neighbours of a boy, who was kidnapped and murdered earlier this week, surrounded a police station, claiming that an accused was being shielded by the police and yet to be nabbed. Billed as one of the biggest cyber crimes unearthed in Ghaziabad, the Special Operation Group has busted a gang involved in cheating unemployed youths of lakhs of rupees by misusing the websites of well-known companies. The Congress candidate from the Faridabad (NIT) Assembly Constituency, Mr A. C. Chaudhary, has lodged a strong protest over the alleged lapse by the district administration regarding the safety and security of the Electronic Voting Machines (EVM’s) presently kept at Lakhani Dharamshala here. Collaboration of states with the Union Government for meaningful initiatives in school education and taking inspiration from the world around were some of the suggestions that were thrown up during the first meeting of the Committee for Consultation with the States (CCS) on National Curriculum Framework Review here yesterday. An exercise to hone in their knowledge of their rights and duties and to provide an insight into what they perceive should be done to highlight the concerns of children was organised by the members of the Bal Panchayat. It is an attempt to indulge the taste buds to raise money for the rehabilitation of the tsunami victims. The students of AKJ Mass Communication Research Centre, Jamia Millia Islamia, have announced a charity dinner inviting alumni and personalities from the film and television to raise money for the rehabilitation work. As a part of the cultural exchange programme, a joint initiative of the Indian and Italian governments to strengthen the cultural ties between the two countries - National Gallery of Modern Art will host the prestigious art exhibition titled, ITALIAN ART 1950-1970 - masterpieces from the Farnesina Collection’ from February 16 to March 6. The highly-acclaimed exhibition, curated by Prof Renato Miracco, showcasing rare masterpieces during the period 1950 to 1970, would be inaugurated on February 15 by the Union Minister of Culture, Mr S. Jaipal Reddy, Mr Gianfranco Fini, Minister of Foreign Affairs, Government of Italy in the presence of Mr Carlo Azeglio Ciampi, President of the Republic of Italy. Reminding the Manmohan Singh Government that justice delayed was justice denied, Delhi Pradesh BJP president Harshvardhan and former Rajasthan Governor Madan Lal Khurana today said that the Justice GT Nanavati Committee’s report should be made public without delay in the interest of the nation. The Reserve Bank of India (RBI) has authorized select branches of Commercial Bank (list available www.newdelhi.rbi.org.in) to accept and exchange all types of soiled/mutilated notes. The general public can also tender soiled and mutilated notes for exchange at the Reserve Bank counters or can send such notes to the Reserve Bank of India, Issue Department, New Delhi, by Registered/insured Post. The Petroleum Conservation and Research Association (PCRA) today organised ‘Save Oil-Women’s Two-Wheeler Rally’, to showcase women power. The rally was flagged-off by the Union Minister for Petroleum and Natural Gas and Panchayati Raj, Mr Mani Shankar Aiyar, at the India Gate today. 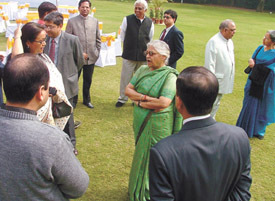 The Delhi Assembly Speaker, Chaudhary Prem Singh, today suggested that the Delhi Government should provide housing facilities to journalists in the Capital. The Speaker said journalists should either be allotted quarters or land to build their own houses. He made these remarks while inaugurating a free vehicle pollution check up camp, organised jointly by the Indraprastha Press Club and the Delhi Government. The Managing Director of ITC Hotels Limited, Mr Nakul Anand, presented the prestigious ITC Award to eminent Sarangi maestro, Pandit Ram Narayan. The award was presented during the inauguration of the 33rd ITC Sangeet Sammelan at the Kamani Auditorium here today. The Managing Director of ITC Hotels, Mr Nakul Anand, presenting the ITC Award to Pandit Ram Narayan in the Capital. The Bharati Vidyapeeth’s Institute of Management & Research, New Delhi, organised a two-day management festival, ‘Renaissance’ on its premises. Inaugurating the festival, the Delhi Minister of Finance, Dr A. K. Walia, praised the efforts of management and students for putting up a splendid performance. He informed the students about the developments related to the 2010 Commonwealth Games. The police have announced a cash reward of Rs one lakh to anyone who provides any clue or information of the abducted schoolboy of Hodal town in the district. Though over five days have passed since the nine-year-old student has been missing, the police have not been able to make any headway into the case. The district unit of the Akhil Bhartiya Vidyarthi Parishad (ABVP) has demanded a CBI enquiry into it. The Crime Branch of the Delhi Police is investigating a case against a senior officer of the ONGC, after a scribe alleged that he had molested her in his office in October 2004. The Municipal Corporation of Delhi will be introducing unit rates system for awarding contracts of civic and development works. According to a press release here, works like repair and maintenance of municipal schools, hospitals, dispensaries etc would be awarded to the contractors on rotation basis by weekly draw of lots. According to the police, Diwari Lal, the father of the victim, made a complaint to the local police that his son was missing from his residence in Model Town Jhuggi. In his complaint, he named two suspects, whom the police claimed to have arrested on February 9. The police arrested one Babulal and Inderdev in this connection and claimed to have solved the case. However, this morning the boy’s parents, relatives and neighbours surrounded the Model Town police station, challenging that the police had failed to arrest another accused in the case. They also blocked the traffic in the area for some time and senior police officers arrived at the scene to pacify them. The boy’s father had suspected Babulal, as he had objected to the latter teasing his daughter, the police said. On interrogation, the accused allegedly confessed that they had kidnapped the boy, murdered him and dumped the body behind a temple near the Model Town in an iron box, said the police. Acting on the disclosure statement of the accused, the body was found, which had injuries on the forehead and the neck, they said, adding that a case of kidnapping and murder was registered against the duo. A major fire broke out in an electronics godown in Narela area of West Delhi this morning, causing substantial loss of property. According to the police, the fire took place at around 5 a.m. The Delhi Fire Brigade sent 30 fire tenders immediately to the spot to control the blaze. The fire was initially noticed in a godown that spread quickly in surrounding buildings. The godown, where the fire was initially noticed, is situated in the main chowk of Bakauli village near Narela. The part of the building, having the godown is spread in an area of 1000 sq mt, which collapsed during the fire. The police have arrested seven youths including the ringleader, who was publishing a newspaper in the name of ‘Naukri Digest’ from Ghaziabad to lure the unemployed youths. The gang was active in Agra, Noida, Chennai etc. The police received a tip-off regarding the activities of the group during an investigation on cyber crimes, said the Superintendent of Police (City), Mr Umesh Srivastava. The gang would download datas from the websites of well-known companies like LG, Moser Bear, Techno- mech and GTCL and publish them in their ‘Naukri Digest’. Meanwhile, in order to lure the unemployed youths, the gang would dispatch letters to selected few, informing them that they were being considered for employment in these companies. They were also directed to remit a certain amount in specified bank accounts in IDBI, ICICI, and HDFC. Later, the deposited amounts were withdrawn by the gang members, the police chief said. Based on a tip-off, the police nabbed one Savtantar Sharma, alias Omi, alias Sanjay Kamboj, who confessed to the crime and revealed the names of his associates, identified as Sanjay, Gaggan, Manku, Suhender Pratap Singh and the gang leader, Praveen Kumar. Subsequently, the police arrested all of them and seized a computer, UPS, debit cards of various banks, which were made on the basis of fake names and addresses. One of the bank accounts operated by the youths showed a balance of Rs 5-6 lakh. The gang is reported to have cheated the unemployed youths of over Rs 20 lakh, the SP said. He revealed that the gang was operating in Hyderabad, Noida, Chennai, Agra etc. Noida:A person has been arrested by the Sector-24 police for smuggling of ganja. During patrolling, four kg of ganja have been recovered from the accused. Another person has been arrested by the Sector 39 police. A revolver and some cartridges were recovered from him. Both the arrests were reportedly made by the Noida police on the information provided by an informer. Acting on a tip-off, the SI Ranjit Kalian apprehended a youth at the tri-junction of 12-22-54 sectors. Four kg ganja were recovered in a bag from the accused. He has been identified as Bhola Sahai of Khagariya, Bihar, who was living in Choda village in Noida. He was procuring ganja from Delhi’s Sadar bazaar and supplying in Noida, police said. The counting of the votes that were polled on Februrary 3, will be done on Februrary 27. Mr Chaudhary has alleged that the security was quite loose and it must be strengthened immediately to avoid any irregularity. 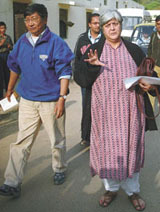 In letters shot off to the district, state and the Election Commission of India, Mr Chaudhary has claimed that in the surprise check made by him and his supporters on Thursday night, he found that all the main gates were wide open and the policemen posted there were very casual in their approach and they did not even try to stop them from entering into the premises. He said he visited to the place after someone told him that some outsiders had been staying on the premises and had been consuming liquor there. He also claimed that some of the cops on duty there, who ought to be alert and attentive, were also involved in this development, which he said was very serious. Stating that anybody could enter the place and the EVM’s placed there were not at all safe and secure, while the Commission has directed that nobody (outsider) should be allowed within the 200 metres radius of the place. It is learnt that while the authorities have allowed three supporters of a candidate to stay put at the place till the counting date, the drinking of liquor, however, was not allowed. Senior officials of the police reached the spot last night, when Mr Chaudhary took up the issue with the Additional Deputy Commissioner and the district police chief. Meanwhile, the administration at Ballabhgarh have disallowed the persons having their shops or offices at Aggarwal dharmshala to resume their work from the spot till the counting of the votes. It is reported that a delegation of the shopkeepers met the SDM yesterday to seek permission in this connection, but it is stated that their request was turned down by the authorities in view of the safety and security of the EVM’s kept there. The Congress candidate from Ballabhgarh had also written to the officials concerned for not allowing any shop or office to function till the counting is done. The meeting, organised at the NCERT, also witnessed the Education Secretaries of States and Directors of SCERTs share their experiences and present the problems of their respective states vis-à-vis development, implementation and transaction of the curriculum in the context of the diversity within States. The national level meeting was held for opening up the communication channels with various States and Union Territories to ensure wider participation and transparency. The suggestions and comments will form part of the curriculum review process. Around 40 participants from various States and Union Territories, comprising State Education Secretaries and Directors of SCERTs were present in the consultation process. The CCS is one of the five structures created along with the National Steering Committee chaired by eminent scientist, Professor Yash Pal. Inaugurating the consultation meeting, Mr Baswan, Secretary Education, MHRD, emphasised that the synergy between the Government of India, NCERT and the States need to be enhanced. “Without the collaboration of the states, Central Government may not be able to undertake any meaningful initiatives in school education,” he added. Prof. M. A. Khader, Member Secretary, National Steering Committee for Curriculum Review, mentioned that the communication and mutual exchange with States can generate a series of essential data system for a systematic reform process. Addressing the problems in the prevailing examination system, the Group on Examination Reform called for development of analytical thinking, problems solving skills, questioning attitude and flexibility of thought. It was further added that in the process of making a knowledge society, it is imperative for the school education to provide access to information, which can be analysed, processed and then applied in real life situations. The Group on Systemic Reform for Curriculum Renewal presented the areas that need support system to bridge the gap between the rich and poor and provide equal access and quality education. Attempting to explore a vision for education, the group recommended the essential conditions for learning in every school and to reach out to children who face social exclusion. In his remarks, Professor Yash Pal, the Chairman of the National Steering Committee, said that education has to be reinvented in which we should learn from the people around. The National Curriculum Framework Review (NCFR) is expected to conclude by the end of summer 2005 when the review report will be presented to CABE. And at the end of this unique exercise was a report, a compilation of the impressions of the tsunami-hit children, who scanned various newspapers for the news of children and related issues. Chastising the newspapers for carrying the numbers of those who were killed, 13-year-old Sachin had a word of advise: “Instead of publishing that 250,000 people died, I want newspapers to print news about hope not create fear”. He approved of the news related to the adoption of 20 tsunami victims carried by newspapers. Impressions such as these have been tabulated in the report, ‘The Tsunami’s Report Card on the Rights of the Child’. An analysis of the coverage of the disaster by the print media across the country, the report contains the review of news related to malnutrition, education for children, orphan care and trauma counseling, child abuse and other related issues. The members also put forth their suggestions on the treatment and the space that a story related to child issues should get. “There was a small report related to the offer to adopt tsunami orphans. In my view, it should be published on the front page,” recommended 12-year-old Nitesh Kumar. Most of these Bal Panchayat members also found news and photographs of sorrow and despair undesirable and put forth the need to have more stories with a positive outlook. “I feel good to see this picture (a happy child) because it shows a ray of hope in difficult moments. I hope in the future you will consider children’s news in a positive way,” said Ashish Singha, another 12-year-old. A CASP-Plan project, the Bal Panchayat is a platform that addresses child rights and provides a forum through which children can add to their personality and confidence. Although JMI has already raised about Rs 15 lakh for the relief work, the charity dinner is being organised to further the cause. Also, with noted figures from the industry expected to make an appearance, the current crop of students are hoping to make the best of the opportunity. Among the personalities who are expected to make it to the event are Roshan Abbas, Faud Khan, Hemant Chaturvedi, Amar Kanwar and Fiza Khan. The donor tickets are available at the MCRC. As a part of the cultural exchange programme, a joint initiative of the Indian and Italian governments to strengthen the cultural ties between the two countries - National Gallery of Modern Art will host the prestigious art exhibition titled, ITALIAN ART 1950-1970 - masterpieces from the Farnesina Collection’ from February 16 to March 6. The highly-acclaimed exhibition, curated by Prof Renato Miracco, showcasing rare masterpieces during the period 1950 to 1970, would be inaugurated on February 15 by the Union Minister of Culture, Mr S. Jaipal Reddy, Mr Gianfranco Fini, Minister of Foreign Affairs, Government of Italy in the presence of Mr Carlo Azeglio Ciampi, President of the Republic of Italy. The exhibition will focus on outlining the brilliance of some of the finest twentieth-century Italian artists, such as Alberto Burri, Giuseppe Capogrossi, Renato Guttuso, Lucio Fontana, Arnaldo Pomodoro, Piero Manzoni, Fabrizio Plessi, who artistically translated the new urges and inquiries arisen since the post-war period as a prelude to the modern times to the creation of which they have contributed in this special manner. Even after the passage of 20 years, the families of the Sikhs who were murdered or were affected because of the riots were feeling cheated, Mr Khurana said. “It is the demand of time, clean administration and also the right to information as well as principle of transparency that the faces of the real culprits of the 1984 riots be exposed before the people,” he said. Dr Harshvardhan said that the silence of the Manmohan Singh Government reinforces the suspicion that the Congress does not want the report to be made public because it felt the report could pose a danger to the party. The admissible exchange value of which will be remitted by means of bank draft/pay order/money order/credit to their bank accounts, as desired. The refund value of such notes in exchange is paid as per the RBI (Note Refund) Rules, 1975. Excessively soiled, brittle or burnt notes, which cannot withstand normal handling may be tendered personally at the Reserve Bank of India only, a released said. Persons residing outside Union Territory of Delhi and requiring services of the Reserve Bank in the matter are advised to contact the concerned offices of Reserve Bank of India having jurisdiction of the area. Notwithstanding the crowds and busy traffic, large number of women and children responded enthusiastically to the PCRA’s initiative. Complimenting the women and girl students, who came forward to participate in large number in the rally, the Minister said that the rally aims to spread the message of women empowerment and oil and gas conservation. He hoped the rally will motivate them to reduce wasteful consumption of petrol in vehicles, LPG and kerosene at home. He asked the participants to follow the tips mentioned in the various PCRA pamphlets for conserving oil and gas. He also commended the PCRA for targeting women to spread the message of conservation because if conservation had to become a mass movement it had to start from the homes of the general consumers. The Executive Director of the PCRA unfolded the idea behind the rally. It provided an opportunity for women to become stakeholders in the energy conservation movement in the country and boost their self-esteem and sense of achievement. Similar rallies have been organised in Ranchi, Jaipur and Raipur. It has also planned to organise similar rally in Chennai soon. He announced that he would send a proposal to the government to provide housing facilities to media persons, either by allotting them government quarters like government employees or allotting them land for construction of houses by forming group housing society for mediapersons. He recalled that when he was executive councillor, PWD, he had allotted about 29,000 plots to the landless people in different villages of the national Capital. He said that the Press and other media persons should be given full respect and honour, which they deserve. He further said that the Delhi Assembly should pass resolution of condolence at the demise of mediapersons as they are also involved in social service. The Managing Director of ITC Hotels Limited, Mr Nakul Anand, presented the prestigious ITC Award to eminent Sarangi maestro, Pandit Ram Narayan. The award was presented during the inauguration of the 33rd ITC Sangeet Sammelan at the Kamani Auditorium here today. 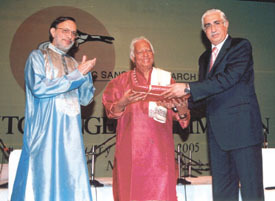 A cash prize of Rs 51,000, a shawl and a citation was presented as part of the ITC Award to Pandit Ram Narayan. On the occasion, Mr Amit Mukherjee, Director, ITC Sangeet Research Academy, welcomed the artists, who had come to participate at the Sammelan. While presenting the award, Mr Nakul Anand, said that the Sangeet Research Academy was trying to bring back the glory of the classical music and to create a system of effective training in Indian classical music. The academy is trying to buttress the oral tradition with modern research methods and technology and to save the ‘Guru–Shishya-Parampra’. The guest of honour, Mr Vikram Sharma, President, Baidyanath group, emphasised the role of stress management and its techniques. “Inner voice of conscious is a big guide,” said the young graduate of Leeds University. The announcement of the reward was made late last evening, after the increasing pressure on the police department from all quarters in view of its inability to get any clue so far. The boy, Anand (Golu), son of a serving defence personnel, did not return home from school on Monday last. Though several teams of police have been despatched in various directions, no success has been met, admitted a police official. The family members of the victim have been quizzed by the police in this connection. No call has been received from anywhere though claims were made earlier regarding the alleged demand of a ransom, said a family source. He claimed that there was some miscommunication on this account, as no ransom has been demanded. The victim, hailing from West Bengal, was working for a news magazine in the Capital and used to visit the office of the accused in Connaught Place for getting advertisements. During her earlier visits, the victim alleged that the accused always used to discuss her private life rather than discussing professional matters. The victim, in her early twenties, alleged that the accused, also hailing from West Bengal, had invited her in October 2004 on the promise that he would give advertisement for her magazine. The accused later tried to outrage her modesty. Despite being threatened, the victim had reported the matter to the police and when she thought that justice was being delayed, she approached the Patiala House Court and pleaded her case in December 2004. After listening to her plea, the judge ordered the Delhi Police to register a case in December 2004 and investigate the matter to provide relief and justice to the victim. The Crime Branch sources said that the victim’s version was recorded and the case is being investigated impartially. “We are handling the case carefully. During the course of investigation, if he was found guilty, he would definitely face the music,” said a senior police officer. It would save time and avoid delay in execution of works. The new system would be effective, simple and financially beneficial, besides being transparent and equity based. It was further stated that a committee comprising of members from engineering, finance and vigilance etc. has been constituted for approval of Unit Rates. The rates so approved by this committee would be applicable for one year curbing any possibility of escalation and would be displayed on the notice boards of all the zones.